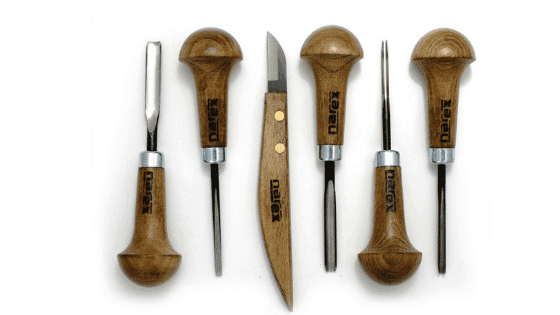 Narex is one of the quality chisel brands on the market in 2019 from the Czech Republic who seems to be one of the highly growing hand tool manufacturers. If you talk about the chisels, they are even more prominent names in terms of quality and performance. 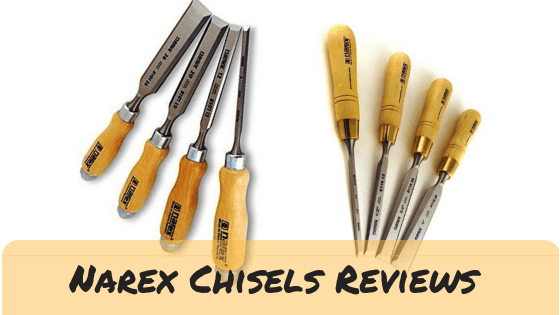 Upon popular request, we have made ourselves to come with an entire Narex Chisels reviews containing the best three picks from their inventory. The list contains a couple of chisel sets, where you will find four pieces in each. And lastly, we’ve picked up a single chisel which is mainly made for micro working. Narex had been one of the very few manufacturers who is producing quality hand tools for a significant amount of time. 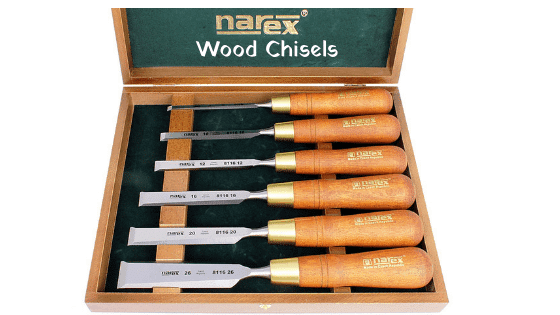 In this regard, we have recognized Narex 4 pc set 6mm Woodworking Chisels as the best chisel that Narex had ever produced. Fine-grained Chrome manganese made blade. A perfect fit for working in tighter work spaces. Four different models of different handle and blade size. It can take and hold a perfect edge. The cross section is slim enough to use in little woodworking. They are ground at 25-degree bevel. Handles are made of European beech wood. Heavy and well-fitted blades along with a couple of ferrules. Requires sharpening before every use. Let us give you the best thing that we have found about this product in the very first place. There are different types of chisels from the same brand which have mortising handles, where this one is of a bevel edge chisel. The benefit of a bevel edge handle is, it is meant to be used in tighter spaces compared to any other kind of chisels. So, if your working area or workplace is narrow enough not to be compatible with a regular chisel, this one should be the go-to tool for you. Secondly, it’s about the blade and its material. As per we are concerned, it is made of very nicely grained Chrome Manganese. On top of that, there is an RC 59 level hardening which is done well on this chisel. As a benefit, the blades seem to hold an excellent edge. Also, we found no deviation in shape and size no matter how hard or regular you make use of it. The ground and the area of the cross-section is always essential to woodworkers. In case of this plate from Narex, we can see an excellent example of perfection. The blades are grounded with 100% accuracy, and the cross-section is pretty much slim. When you have to go with a good variation of woodworking, this would be exactly what you want. We are not talking about only one chisel with exact dimension and size. Instead, there are four different chisels with sizes of 6 mm, 12 mm, 20 mm and 26 mm. In terms of length variation of blades, the range from 4-¾” to 5-½”. All of the handles are grounded at a bevel degree of 25. The handle is 5 and a half inches long in case of four of the units. That seems well enough for every kind of woodworking, right? Now, This is one of the most impressive facts about this product. And that is about the material of its handle. Being made of Lacquered European Beechwood, the handle is proven to be superbly protected against straining and breaking. If you have been using a product made of beech wood, this might sound quite familiar to you. On top of that, the way they have put the blade inside the handle is perfectly uniform. So, there is the least chance of breaking. When you were frequently hammering with a top- quality wooden chisel, it matters that how will be seated the blade is. We have seen heavily made steel tangs to be used in case of this product, which is pretty impressive. On top of that, there are a couple of ferrules to strengthen the blade for massive mallet works. As a verdict, we would like to call it one of the best creations the brand had ever made. No matter it is the blade, the handle placement, the quality of the cross section, are the materials- everything seems to be super praiseworthy. 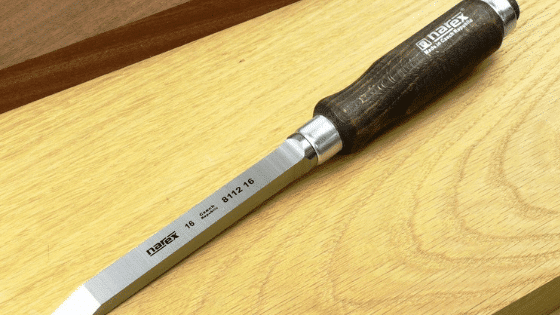 If you are in search of a set of chisels, this one is what we recommend for now. At the next place, we have got a set of chisels that looks almost like the last one, but there are some differences for sure. 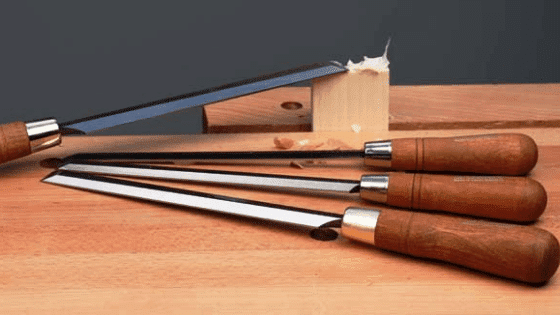 The name is Narex Czech Steel Premium, and it is a four-piece chisel set which is made out of premium grade materials and techniques. Made with minimal size differences for more perfect works. Blades are grounded at 25-degree angle. Size ranges from 4-⅝” to 5-½”(blades). Handles material is natural hornbeam and are 5-½ inches long. A quality pick for micro-level works. Not a great fit for wide and large workpieces. You know, chisels are of some sizes, and there is no such set of four chisels that may fulfill all of your needs. In this case, you may not satisfy with the size range of ¼” to 1-1/16″. Sometimes, you need closer size differences that might help you out to operate even more accurately. Taking all these into consideration, Narex has brought a size variation of ¼”, ½”, ¾” and 1″ of blades. 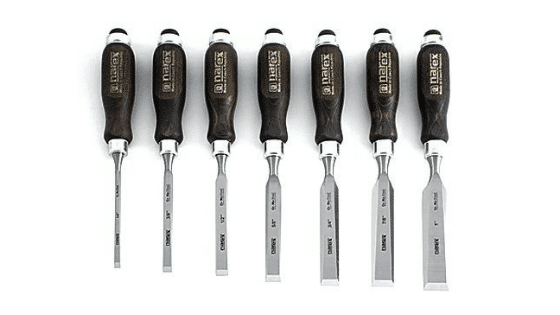 If you have a closer look at the gaps between each of these sizes, you will see the real difference between this set and the last set of chisels we have talked about. Narex had put a benchmark of material quality as long as the hand tools by the brand are concerned. They are fantastic and built to last long. On that consequence, this set of the chisel is made of nicely tampered chrome manganese, and the ingredient type is pretty much nicely grained. As long as you consider the level of hardening, it comes as an Rc 59 standard. This seems satisfactory enough for us. Now, let’s shift our limelight to the blade. If you have a closer look at the blade design, you will find the cross section of the blade to be ultra slim. And for obvious reasons, woodworkers like it in this way. Apart from the slim design, you will find a good and correctly grounded design which is of 25 degrees. What it means is, the blades are at an angle of 25 degrees from the perspective of the ground. Excellent for both critical and general type of chiseling works. Know how to chisel wood like a pro. Like you have seen when we’re pointing at the blade sizes; the handle sizes are also pretty close. That is nothing to wonder about because the size of the handle and the blade has to maintain a particular ratio among them. However, the handle sizes lie within 4-⅝” to 5-½,” and that seems perfect for working on narrow workpieces of jobs. Especially, in case of machinery and wooden types of furniture, that appears to be a real perk to us. No matter how complicated or narrow the workpiece is, you may need to push the chisel hard when you need. But not chisels can intake that. The blade, the handle quality, and even the blade-handle alignment seem to be imperfect to take such loads. But not anymore as long as you have this chisel sets. These are mounted with heavy steel stands along with brass ferrules. In some other modes from the same brand, you may have seen ferrules. Brass ones are no bad, let us assure you. It’s not always that you have to work and chisel on large workpieces only. For narrow spaces, you might be looking for a set which is no longer than 1 inch. If that’s what you are thinking as well, this set is our recommendation for you. The two models that we have reviewed earlier are sets of chisels that are different in blade size and handle size. But as the last pick, we have got a single chisel named Narex 3 mm (1/8″) Woodworking Cabinetmaker’s Chisel. It is still from the same brand, and it has some specific qualities that made its position into this list. An ultra-thin 8mm blade dimension. Perfect for micro works on a small workspace. The bevel ground degree is 25. Made out of high-quality chrome manganese. Handles are made of high-grade European Manganese. A finely grained materialistic strength. Smooth and easy to grab handle. It doesn’t come as a set of chisels. Not a good fit for extensive workspaces. The thickness of the blade edge is ⅛ inches in case of this chisel. You may ask why? Well, there are undoubtedly complicated workspaces where you need to chisel on a very narrow panel like ⅛ inches. And such a chisel with this same size is not available in common chisel sets. That’s what drove Narex to produce such a brilliant chisel. In other words, it is 3mm in size. Of course, the chisel blade is narrow. But that comes with the essence of high-quality material as well. Narex won’t disappoint you at this point, as they have made the blade out of highly grained chrome manganese. And just like any Narex chisel, they have hardened it at Rc 59 degree. You don’t expect your chisel to be parallel to the ground, neither do we. So, the bevel degree of this chisel is given as 25 degree, which is also the most standard bevel count as well. With a decent angle, you can make cuts on any surface you want. Right after the blade, the only remaining part of the chisel is the handle. And the handle is made out of European Beechwood in case of this mode. So far we have seen, this is the best practice in case of handle materials among all manufacturers. If you get to buy this chisel, we don’t discourage you from buying another set of regular chisels. Because this is only applicable when the workpiece is pretty much narrow (8mm). If you have got more full spaces to chisel on, you must reach higher dimensions of blade edge thickness. In total, this will be a perfect combination. Lastly, we want you to have a look at the handle design and compare it to the other regular chisels you get to see a lot. This one is smoother and easier to handle. Especially, when you’re working with wet or sweaty hands, this one will be an excellent perk. In case you are stuck with a small workspace and a broad chisel that doesn’t fit within it, this is the best woodworking chisel for you. And as long as it comes from Narex, the quality factors are entirely satisfying. The first set of chisels that Narex produce is the pairing chisels. They have some chisels which are light, long, thin and almost flexible. Pairing chisels are never hammered and malleted. The best use of a pairing chisels is shaving off the light amount of woods form a joint space. We have included mortise chisels as another kind of Narex products. Mortise chisel is mostly used to chop out wood materials while creating joints. Narex bevel edge chisels are kind of sort and beveled chisels that are widely used to create joints. They are also known as Narex carving chisels, and those are used in sculpting and intricating designs. Wood chisel from the inventory of Narex is all of the chisels used in woodworking. Well, so that was about our three-piece Narex chisels reviews, and hopefully, you liked it. If you are a fan of Narex- the brand, we’re sure that you will pick one of these three as your next work companion. Best of luck!